William H. Whitlock, a carpenter and house builder by trade, purchased this property in July 1913 in the town of Silver Grove. Silver Grove was once a separate community, incorporated in 1886. The boundaries were roughly: Silver Street to the west, Charlestown Road to the north, Beharrell Avenue to the east and Spring Street to the south. It had its own town hall with town council along with its own police and fire departments. Silver Grove became part of New Albany in 1915. William built the house immediately after purchasing the property. 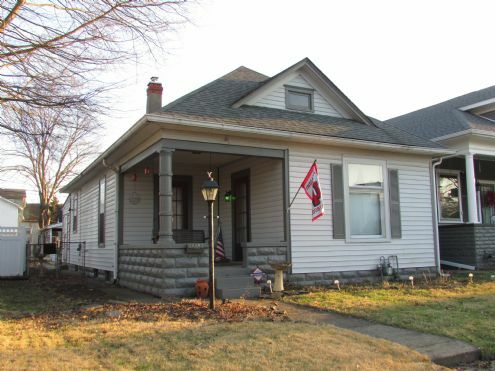 The first listing for the home was in the 1915-1916 New Albany City Directory and lists his son and daughter-in-law, Frank M. and Martha, as living here. Frank was a barber for August Highfill and later owned his own shop at 1002 East Oak Street. He died in the early 1940s and his widow remained in the house until 1965. Martha was a seamstress for P.A. Niemaier Co., a men’s clothing store, located at 222 State Street in downtown New Albany. By 1966, she was living in Parkview Towers and in July 1967 she passed away at the age of 75. Neighbor Henry Paquette, at 2108 Ekin Avenue, purchased the home in August 1965. The house was used as rental property for a short while until Kermit and Linda Hendrick purchased the property in July 1971. Kermit was employed at General Electric in Louisville. By August 1975, the Joseph J. Hilton family was residing here. Hilton was a production worker at Hillerich & Bradley, where he later retired. The Hiltons retained ownership of the home until March 1997. The property’s judgment number is 22D01-1804-MF-000464. With this number you can visit the Clerk’s Office in the City-County building and enter it into their computers to find the judgment owed on the property. This is public record. Contact: To be sold at Sheriff’s Sale Thursday, 21 February 2019 at 10:00 AM on the third floor of the City-County Building (311 Hauss Square, New Albany). Judgment number: 22D01-1804-MF-000464.